Microsoft clearly created Windows 8’s new Start screen and its ecosystem of apps as the heart of Windows 8. Changing Windows 8 so drastically would have alienated millions of Windows users worldwide, however. So, the traditional Windows desktop lives on in Windows 8’s Release Preview. And, in keeping with Windows 8’s new app-based approach, the desktop is simply another app. When you’re ready for work, click or tap the Desktop app from the Start screen, and Windows 8’s desktop fills the screen), looking much like the desktop in Windows 7. In Windows 8, the traditional Windows desktop lives on as just another app. In the biggest change by far, the desktop lacks a Start button. Pointing in that lower, left corner now brings a pop-up icon for the Start screen. Click the Start screen icon, and the desktop disappears, leaving you at the Start screen to launch programs or apps. To return to the desktop, click or tap the Start screen’s Desktop tile. But other than the missing Start button, the desktop in the Windows 8 Release Preview looks and behaves almost identically to the desktop in Windows 7. Most of the menus are also the same, so Windows 7 upgraders should feel fairly comfortable. 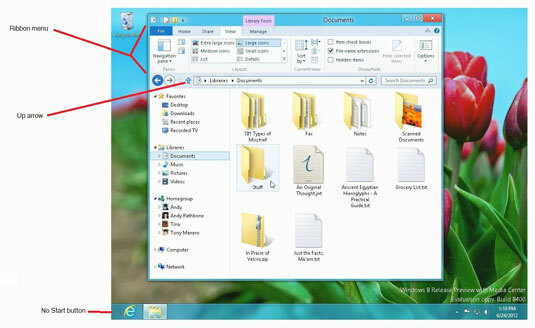 Several Windows 8 programs, including Windows Explorer, now sport a Ribbon menu – a thick, icon-stuffed menu across the windows’ top edge. Click a tab atop the ribbon, and the entire ribbon’s contents change to show a new group of icons. Click View tab, for example, and the Ribbon changes to show different ways to view a folder’s contents. Microsoft Office suite of programs has featured the Ribbon menu for several years, so Office users will recognize the menu immediately. For others, the large ribbon and its tabs may require some practice. A perk tossed in for file management fans, the Up Arrow icon returns in Windows 8’s Windows Explorer. A click of the Up Arrow icon moves your view up one folder, just as it did in Windows XP. Keep clicking the Up Arrow icon, and you end up with a folder showing your desktop’s contents, as well as your libraries. Since clicking the Up Arrow always brings you back to home base, you can drill deeply into folders without fear of getting lost. The desktop in the Windows 8 Release Preview will run Windows 7 and Windows Vista programs. It runs some Windows XP programs, as well, but Microsoft is vague about the level of support. For example, Windows 7’s Compatibility Mode helps you run programs written for Windows versions going back to Windows 95. The Compatibility Mode in the Windows 8 Release Preview only offers help for Windows Vista-era and newer programs. By cutting back on compatibility settings, many are wondering how committed Microsoft may be to supporting Windows XP programs. Note: At the time of this writing, Microsoft hadn’t yet completed Windows 8. Some of these details could change when Microsoft releases Windows 8 later this year.